You have helped me come to terms with my lack of judgement in men and helped me realize that it is really hard to get away. I’m like you. I say I want to “fix” people. We see the best in them and try to it bring out. I’ve discovered that people don’t change. But it’s also ok to set the bar high. It’s not your fault that you set high expectations for people and they tend to let you down. Just keep the expectations realistic and the right guy will fill the void. At least I keep telling myself that. For now, I enjoy the lack of fear. Best and most important feeling ever! It’s such a delicate balance, isn’t it? My brother likes to tell me my “picker is broke”, and I guess for the most part it is. I can sit around all day knowing in my head what I want, but if I accept something less, then what is the point of knowing?? There is a huge difference between seeing the good in someone and ignoring blatantly obvious signs of assholeness. You’ll learn the difference……just believe in your own worthiness. The ignoring is the issue. I would like to believe I am getting smarter though! You’re getting WAY smarter, and I’m so happy whenever I hear “empowerment” coming from someone. 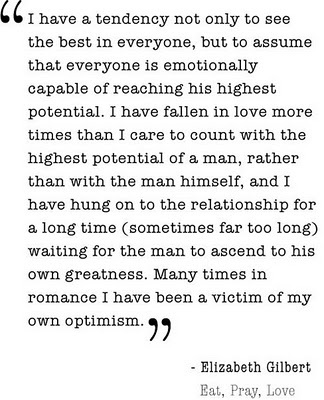 You are “optimistically smart” about love, and that’s going to make all the difference in the world. Guess what? When we’re down on ourselves, others pick up on it and prey on us like vultures (just like f*** stick did). When we’re strong and feeling great about ourselves, that’s the kind of person we’ll attract! I can feel your strength and self-worth coming through and I’m so happy!!! You are far from desperate! You’re an empowered, strong, beautiful woman! Thanks Clara!! I am starting to feel better, and truly believing that none of this was my fault. He is a very sick person!! I found out last weekend, from our mutual friend, that he has an extensive history of physical abuse towards women. I don’t want to say finding that out makes me feel better, but at the same time, it does because I’m not alone in what happened. Thanks for being such a great supporter!! 🙂 PS It should make you feel better knowing it was not just “you” he chose to abuse, but he’s a totally sick person who will, in all probability, continue to abuse women for the rest of his life. I’m SO glad you’re not with that thing (I cannot bring myself to call him a man because real men don’t hurt women like that)! A very happy day to you! I agree, he is not a real man!! And a happy day to you too!! One of my favorites from South Pacific! Put that one on your playlist, too. 😉 And “Fighter” by Christina Aguilera. (Dorky video, good song.) Never lose that optimism. It may be misguided on occasion, but life is awful without it. Hang in there, sister!